TheMonday morning cupcakes are starting to become a sort of tradition. Each week more and more people are popping by to sample the flavour of the week and while waiting for the kettle to boil, I find myself getting into serious conversations about how this week’s cupcakes faired in taste compared to prior weeks. You can’t go wrong with chocolate and fruit. 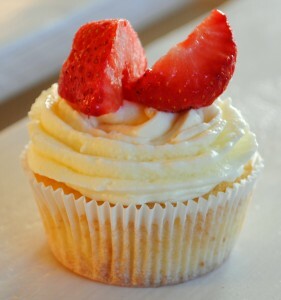 This cupcake is a white chocolate chunk vanilla cake base, topped with a white chocolate icing and fresh cut strawberries. I found a good anonymous quote online which is rather fitting – “Chocolate is nature’s way of making up for Mondays”. These white chocolate strawberry cupcakes are the perfect make up for Monday, and best when shared at morning tea time or at a breakfast date.